HomeAll RSSHow Can NASCAR Improve their Ratings in 2019 and beyond? It’s no secret, NASCAR TV ratings have been dropping on a yearly basis. In 2018, NASCAR hit rock bottom in the ratings at some of their most popular tracks. 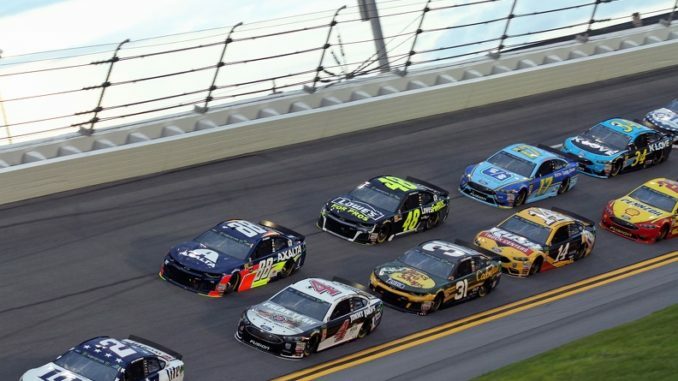 We knew it was going to be a tough year with the ratings when the 2018 Daytona 500 drew an all-time low of 5.3 in the Nielsen Ratings. Unfortunately, things didn’t get better despite the historic battle between Truex, Harvick and Busch during the regular season and then the dramatic racing during the playoffs. For the year, at least two-thirds of the races experienced their lowest ratings in the last 10 to 20 years. Martinsville, one of the sport’s long time tracks, saw its lowest rating in two decades. Richmond, another popular race among NASCAR diehards, saw the lowest ratings of any race since 2000. The biggest story in 2018, was the Supreme Court’s overturning of PASPA, which allowed states to legalize sports betting if desired. It was a ruling that shook the foundations of every major sport including NASCAR. Initially, a few drivers and fans embraced the idea. However, by the end of the season, NASCAR opened itself up to further implementation of sports betting. With numerous states legalizing sports betting, it’s become increasingly easier to bet on NASCAR. Tracks at Dover and in Vegas are allowing fans to bet on the race right from the track. And, this trend will continue heading into the future especially as additional states with NASCAR tracks legalize sports betting. For example, Michigan is one state on the verge of rolling out their sports betting platform. In the next few years, we could see other states with tracks like New York, California, Alabama, Florida and Indiana do the same. But, for NASCAR to stop the bleeding with their TV ratings then they should seriously consider fully embracing sports betting. Create sports betting content that focuses on the various types of NASCAR wagers. Show moneylines and other betting odds during live television. Make it even more symbiotic with the sport’s online platforms. Last year, NASCAR added a new race at the Charlotte Motor Speedway’s Roval. It was something new not only for the fans, but the drivers too. This new challenge sparked a buzz that surpassed just about any other race of the season. It brought an element of unpredictability, which makes for compelling television. The Roval is a road course that NASCAR positioned as one of the early races in the playoff format. This added a great deal of pressure for the playoff drivers, and excitement for the TV network. NBC Sports announced via Twitter that the overnight ratings went up 10% from 2017 as the race posted a 1.99 rating. This is big news considering how the majority of races saw a significant decline in the ratings from 2017 to 2018. The Roval also turned out to be the highest rated race at Charlotte Motor Speedway since 2014. The success of The Roval is further proof that new races with uniqueness and unpredictability will improve TV ratings. NASCAR needs to seriously explore adding new tracks to their 36-race season. They can start by eliminating tracks from holding two annual races other than the sport’s most revered locations like Daytona, Darlington, etc. There’s no doubt that fantasy football helped propel the NFL to becoming the most popular sport in America. Fantasy sports gets viewers and fans invested in a sport, league or game that they might not otherwise watch. According to the Fantasy Sports Trade Association, over 20% of Americans play fantasy sports. This number is expected to grow in 2019. With that said, NASCAR needs to figure out how to best include fantasy sports and help the gaming industry best adapt to NASCAR’s new racing formats. Of all the major professional sports in America, NASCAR has the oldest population. This is largely due to fans watching the sport for the past few decades and continuing to stick with it. The major problem that NASCAR faces is a lack of younger fans. NASCAR hasn’t been able to connect with the millennial population and will definitely need to accomplish this in order to prevent sagging ratings and poor live attendance. Effectively marketing some of the sport’s younger millennial stars could be a great place to start. Additionally, fantasy sports and sports betting can also attract more millennials. Another area that could really help to connect with millennials is an expansion of online platforms. Nowadays, streaming content has become the biggest attraction for customers. Traditional TV and cable outlets have price gouged customers for too long. Furthermore, platforms like NETFLIX have really made viewing content easier and more convenient. We live in a world where the majority of daily life is spent on a tablet or smartphone. This is even more prevalent in the millennial generation. NASCAR is late to the streaming party, but that shouldn’t stop from them from putting their foot on the gas pedal and really hammering out a fantastic online experiecnce. Online streaming is the future of TV, sports and movies. ESPN recently dove head first into this platform and so has Disney. Both will make a lot of money once they reach their full potential. NASCAR can also make more money and improve their overall presence with a streaming platform and a comprehensive app. Once these platforms are fully implemented, and some are already in their early stages, unique content has to be the focal point. In-car camera views, listening to radio communications, having access to various camera views around the track, and being able to access race data live are just a few ways that NASCAR can really succeed with online platforms.